In anticipation of tomorrow’s Championship Round between Mary Magdalene and the winner of today’s Dietrich Bonhoeffer vs. Emma of Hawaii match-up, we thought we’d scour the interwebs for other Golden Halos. There is only one that counts, of course, and we will soon be driving these other folks out of business. But just so you don’t get confused tomorrow, we thought we’d highlight these interlopers. First we found an organization called Golden Halo Eldery Care. Who knew “eldery” was even a word? Since it has do with nursing homes and elder care, I can only imagine it’s synonymous with “elderly.” It’s not clear whether the caregivers are saints or whether their services prepare those who will soon enough meet their maker to become saints. Then there’s the Golden Halo Foundation. It’s hard to argue with an organization that helps children with long-term disabilities and their families. I didn’t see any halos on the website — just a plethora of butterflys. We wish them well even as we’re slightly annoyed that they own the domain name www.goldenhalo.org. 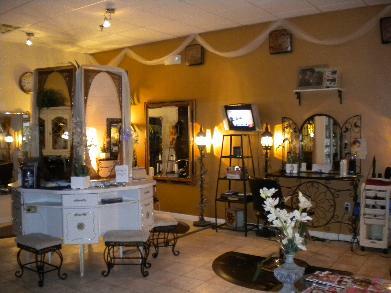 We’re less enamored with the Golden Halo Salon in Culpeper, Virginia, whose slogan is “Look hot and heavenly at the Golden Halo Salon.” I guess if you’re going for that saintly glow this would be your place though I think the closest thing they’d offer to an actual Golden Halo would be highlights. And anyway “Vanity of vanities; all is vanity,” the writer of Ecclesiastes reminds us. 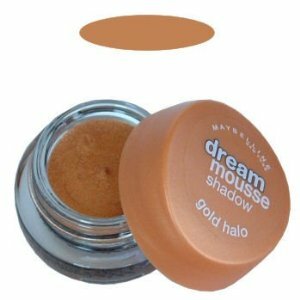 In the same vein, Maybelline has a product called Dream Mousse Shadow Gold Halo. Neither member of the SEC is familiar with such products although we’re both thinking of picking some up in time for Easter Sunday. 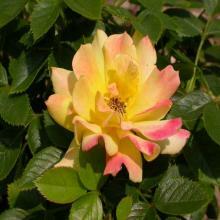 Believe it or not there’s also a rose called the Golden Halo, technically the Rosa Savaholo for you gardening connoisseurs. A bouquet of these babies would make a perfect gift for that special Lent Madness-loving woman in your life. Or guy since we’re all about equality around here. For some reason neither Tim and Scott were not asked to be the featured speakers at the Golden Halo Banquet put on by the Christian Chamber of South Florida. So rude. Finally, here’s a product with which to celebrate the winning of the Golden Halo. 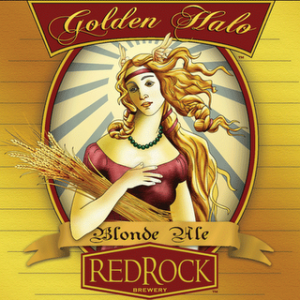 Drink to your favorite saint with Golden Halo Blonde Ale from Red Rock Brewery in Utah. If the St. Pauli Girl-esque label is too much for you, perhaps you’ll prefer the more staid yet much creepier older logo. Well, there you go. I hope this little exercise makes you appreciate the Lent Madness Golden Halo even more. We’ll see you at 8:00 am Eastern Time to start the voting. 13 Comments to "Other Golden Halos?" Believe me, it’s the caregivers who are the saints, especially the daughters, married or otherwise. 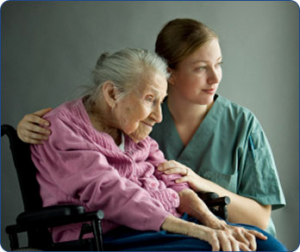 It seems to be a societal expectation that it’s a daughter’s bounden duty to take care of aged parents, preferably in the family homeplace or the daughter’s home….anywhere except a nursing home. Were you really expecting a comment about the blonde ale creepy logo? I didn’t think so. Padre Tim, please don’t make me believe you drink anything with such a logo! Oh..you gave it up for Lent, didn’t you? Not in the Final Four, but quite heavenly anyway. In 2000, Bronx high school teacher Charles Best launched DonorsChoose.org to enable individuals to connect directly with classrooms in need. Public school teachers post classroom project requests (such as pencils for a poetry writing unit or microscope slides for a biology class) at DonorsChoose.org. Donors browse the lists of classroom needs, give any amount and hear back from the class they helped with photographs, thank-you letters and a cost report showing how every dollar was spent. I guess it shouldn’t be so amazing to me that a priest without a regular altar shouldn’t have anything else to do in Holy Week! Thanks for the beer tip! Actually, the beer logo is a rip-off of Botticelli’s Venus Arising From the Sea……pagan to the max! It has been fun taking this trip with you during Lent… sometimes a bit too much but mostly fun. Now one small favor. I’m pretty sure that I know who will win the Golden Halo and that I will be voting for her. I know that my Jayhawks lost last night. So I’m one out of two. Could you arrange for some saintly help for my Baylor Bears tonight, that’s the women’s final four just in case you don’t know. Blessings! Really good work, Tim! Can’t wait for tomorrow!! Love the beer one!! Any chance you can review for us which saints have won the Golden Halo in the past? Nice. I think Ms. Golden Halo Blond Ale looks a bit like Venus on the half shell. Or someone’s idea of Mary Magdalene? Having had some experience with nurses in the ICU, I would advocate a special Halo for these people whose patience and compassion for their wards warms the soul. Sister Mary, in 2011 C.S. Lewis defeated Thomas Becket by a hair and in 2010 George Herbert beat Julian of Norwich. It has been fun. My sister has been a caregiver to my parents for several years. She also deserves a golden halo! And, maybe sniping at the word “Eldery” should stop when the author spells the plural of butterfly incorrectly (isn’t it “butterflies”? Looking forward to tomorrow’s contest.